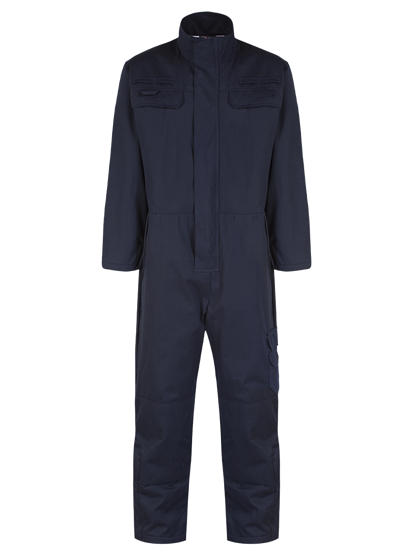 Concealed zip with plastic stud front fastening storm flap. Stand collar. 2 breast pockets with Velcro fastening flaps. 2 side pockets with self fabric pocket bags. Internal phone pocket. Sleeve pocket. Action back. Thigh pocket with Velcro fastening flap. Knee pad pockets. Ankle gussets with plastic zip fastening. Thermal wadding quilted to FR liner. HV Yellow upper body and sleeves, and lower legs. Contrast Navy collar, lower sleeves and legs. 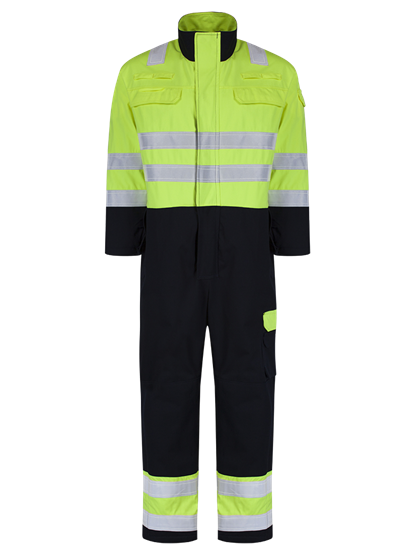 FR reflective tape to body, sleeves, legs and over shoulders.